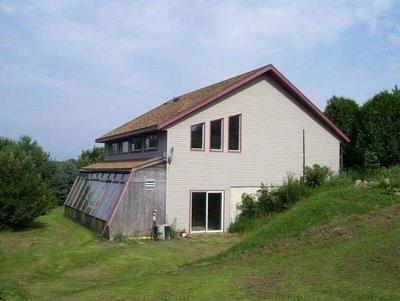 Well, we have been talking about buying some property in Wisconsin to retire to in the future, and we actually closed on a 44 acre farm with a house this past Friday. We had gone land hunting on a few trips to the southwest of Wisconsin, called "the driftless region" since it was not glaciated and flattened like most of the upper midwest. It's a pretty area, with lot's of small farms. The last few years, since the kids all graduated college, we have been kind of enjoying the extra available cash by relaxing our normal frugality. Well, back to clipping coupons and trying hard to stay on the budget. We think it's a smart move to buy, since as we've all been reminded, stocks aren't always the best bet to save for the future. Anyway, here are a couple pictures. They show one of the features that really attracted me. 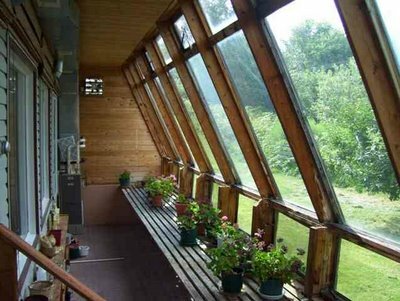 The attached sun room/greenhouse makes the house energy efficient, and has good potential for upgrading with solar panels. I'll tell more about the "farm" later. I love it!! I'm jealous.